I wanted to try this one few weeks before. But I tried this last sunday and it came out pretty well. 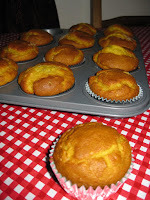 I got the recipe from Bhawana's blog.. 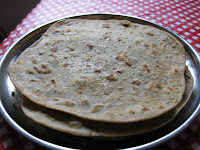 Here is the recipe I followed to make this parathas. Soak channa dhall over night. When you are planning to make this for lunch, then in the morning knead the dough adding required amount of salt for the dough and keep it aside. Drain the channa dhall from water and keep it aside. Pre heat the oil in a pan, splutter cumin seeds, add the red chillies, coriander leaves and asafoetida powder and fry it for a minute. Now add the filtered channa dhall to it and fry it till the water it fully absorbed. Let it cool and grind it nicelyadding required amount of salt to it. This is the filling. Now divide the dough in to equal parts, flatten it into a small circle, fill it with the dhall, cover it and flatten it to the size you want. Cook it in a hot pan, on both sides, applying oil or ghee according to your taste. This was our lunch on Sunday along with white rice. Surprisingly, my twins also had dhall paratha, little bit rice, dhall, raita and little bit dhum aloo..
Tomato Rice is my favourite dish. I use my Rasam Powder for making Tomato rice instead of Masala powder (coriander powder + Chilly powder). This receipe is based upon my way of making Tomato rice. The ingredients are as follow. Soak the rice in water for 10 mts. Cook the rice in a pressure cooker upto 2 whistles. Do not over cook the rice. keep it and let it cool. In the mean time, take a wide pan, pre heat the oil and butter, add mustard seeds, when it splutters add urid dal, cumin seeds and cashews to it and saute for a minute. Now add green chillies, onion to to it and stir it for another one minute. Add the cut tomatoes to it and now add turmeric powder, rasam powder (can be replaced by coriander powder+chilli powder) and salt to it and let it cook in the medium heat. Now add the cooked rice to it and stir it carefully. Do not mash the rice. Garnish it with coriander leaves. 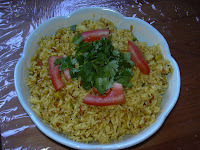 Method : Soak the above said Rice, Dal, Pepper and Red chillies for 2 to 3 hours. Grind the mixture with salt coarsely without adding much water. 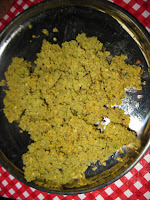 Now put the Asafoetida and curry leaves in the batter and mix it thoroughly and keep it aside for an hour. This batter may not need fermentation. 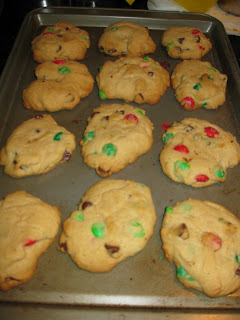 If you want sour taste in it, you can keep it in the oven for an hour or two . Now heat the pan (Iron Dosa Tawa will be good for Adai) and spread the batter , into a medium round shape and make a small hole with a spoon in the middle. Now pour 1 tsp sesame oil along the edges and into the hole. After a minute or two, turn it over and pour one more tsp oil. Take it out after a minute or until it turns golden brown and crispy. 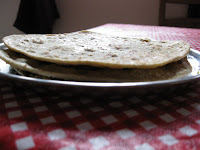 It is better to cook the adai in medium heat. 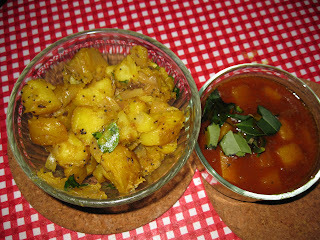 Better side dish would be Jaggery and Ghee. Avial will also be a good combination for adai. Try this and lemme know your comments. 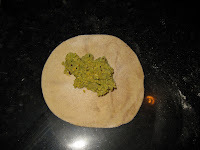 Note: Can also make drumstick leaves adai, plantain flower leaf adai with this batter. Preheat over to 350 degrees. Cream together butter, white sugar and brown sugar until smooth. beat in the egg, then stir in vanilla extract. Dissolve baking soda in hotwater and add it to the batter. Stir it well. Now add the salt. 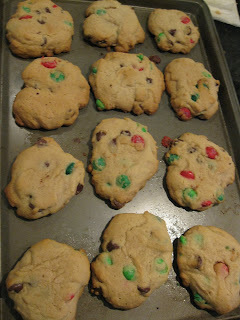 Stir in flour, chocolate chips, m&m chocolate pieces. Drop by large spoonfuls onto ungreased pans. 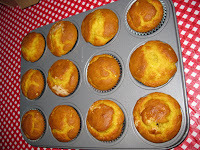 Bake for about 10mts in the preheated oven or until edges are nicely browned. In my mom's family, my grandparents don't eat onions and garlic. 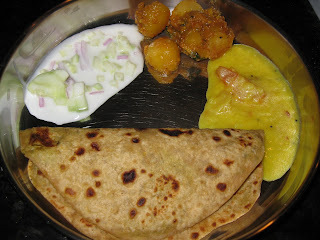 Whenever they make roti or chapathi, my patti make this dhall for them and some other dish for others. Here is the recipe. First pressure cook the dhall, adding chopped tomato, turmeric powder and salt to it. Now take a pan, preheat the oil, add mustard seeds, when it splutters add cumin seeds, green chillies, asafoetida powder and fry it till golden brown. 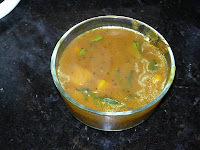 Now add the cooked dhall to it and add 1/4 cup of water if necessary, to it, and let it cook for 3 to 5 mts. Turn off the stove and let it cool. 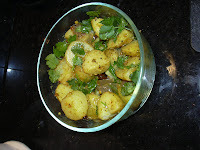 After 10 mts, pour the lemon juice on top of it and garnish it with coriander leaves. Now dhall is ready to serve with hot rotis. We can avoid using lemon juice, if we add more tomatoes. Also, toor dhall can also be avoided. This is a side dish but can also be used with rice. We can also add onions to this. 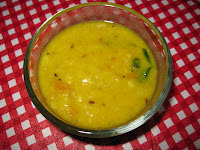 This recipe goes to CMT-Dhal/Kadhi/sambar/rasam, hosting by Priya, an event by Jagruti.